While reports of concerned strangers breaking into hot cars to rescue children trapped inside aren’t always what they seem, that didn’t stop one woman from breaking a car’s windshield with a tire iron to save a one-year-old child who’d reportedly been left in there for 40 minutes. According to a report from WFAA, a woman in a supermarket parking lot spotted a baby sitting inside a locked car on a hot day in San Antonio. 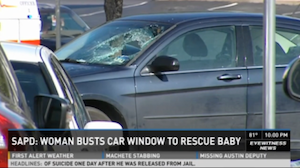 Instead of leaving the child, and despite warnings from those around, including a security guard, reportedly, the woman smashed the windshield with a tire iron and crawled through the broken glass to unlock the door and get the baby out. “I don’t care if I get arrested; I’m going to save this baby,” she said, adding that it was worth the risk. Surveillance footage from the store showed the child in his father’s car for almost 40 minutes while he and another child were inside the store, police say. He was taken to the hospital and treated for dehydration, and will be taken care of by Child Protective Services for the time being. The police say the man said he forgot the baby was in the car, and have charged him with child endangerment.